At the Schedule step of the wizard, select to run the VM copy job manually or schedule the job to run on a regular basis. In the Automatic retry section, define whether Veeam Backup & Replication must attempt to run the job again if the job fails for some reason. During a job retry, Veeam Backup & Replication processes failed VMs only. Enter the number of attempts to run the job and define time spans between them. 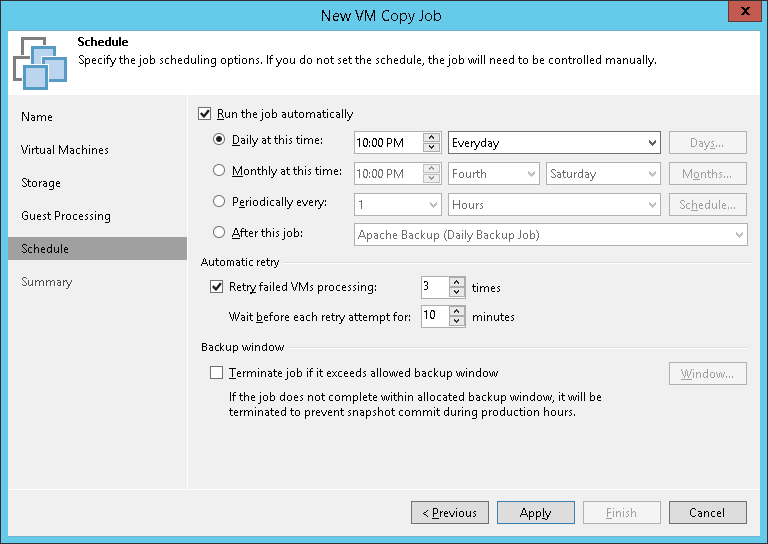 If you select continuous schedule for the job, Veeam Backup & Replication will retry the job for the defined number of times without any time intervals between the job sessions. In the Time Periods section, define the allowed hours and prohibited hours for VM copying. If the job exceeds the allowed window, it will be automatically terminated.